It’s time for the Secret Recipe Club reveal! I absolutely love the blog that I got assigned to this month, My Hobbie Lobbie. Trisha has a great list of recipes to make. When I was reading down the list my eyes immediately stopped at the baked naan. I have been wanting to try it out for a while now. 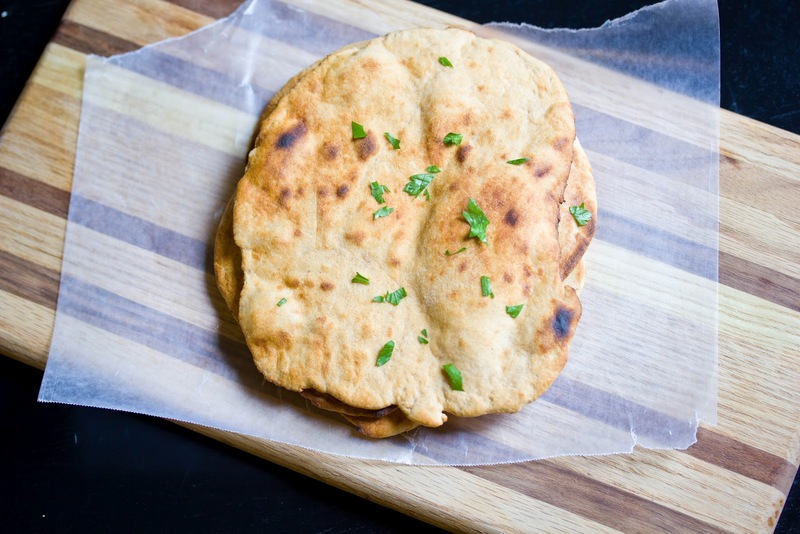 I seriously have about 5-6 naan recipes bookmarked for me to make. The great thing is that you have most if not all the ingredients already at home. I made a few minor changes to the original recipe. Instead of plain flour I decided to use whole wheat and then I substituted regular sugar for powdered sugar. When the bread is done you can top it with so many options or use it for dipping. In large mixing bowl combine the milk and oil and blend the mixture. Then pour in the dry ingredients and stir with the dough hook or knead with your hands for 8-10 minutes. Cover with a tea towel and set aside for about 2 hours. The dough will not rise so don’t expect it to. Turn the oven to the broil setting. Remove the dough and divide into 4 equal parts. Roll out the dough so that it’s flat like a tortilla. Spread a little olive oil over the top and place on a greased baking sheet right underneath the broiler. When the dough starts to bubble flip it over and when it starts to brown the naan is done. Spread some butter on top along with any herbs or seasonings. To keep naan warm place in foil. If you need to reheat the naan do it in the foil.